In between coats of paint, I worked on fixing the metal tremolo cover. In fact, if you look closely at the first photo, you will see that a lot of the surface chrome close to that area has cracked too and is only held in place by magic or something. Then I roughed the surface of it near the crack with a view to trying to solder it together. Remember that the chrome plating in this area was close to flaking off anyway. I figured this was also the least intrusive way to join it without discolouring the surrounding chrome too much. 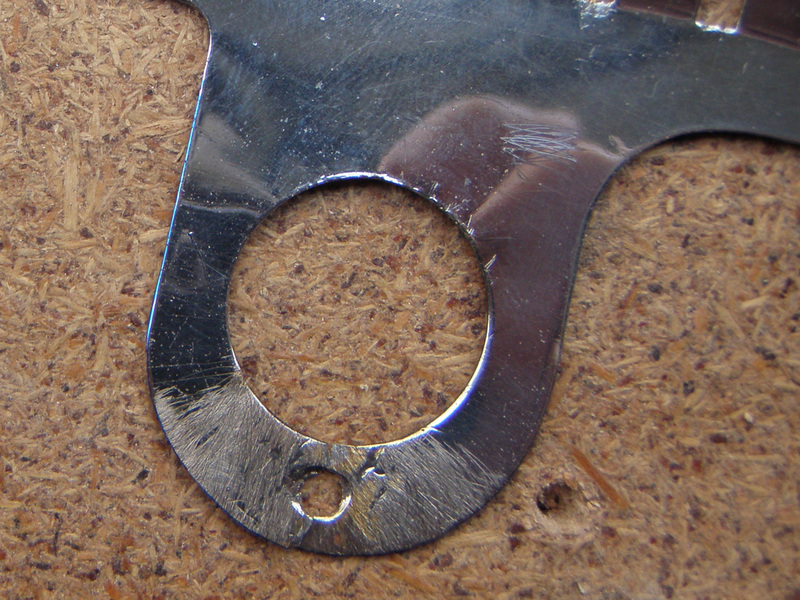 However, I could not get the solder to stick to the metal cover, so tried a different route. 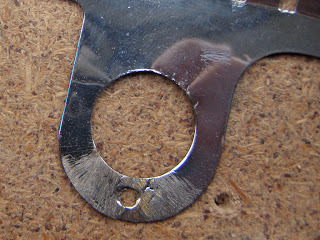 First of all, I set about cutting a piece of aluminium into the shape of a somewhat oblong washer. And here it is all cut out and polished up. However, even the thinner piece looked out of place (don't believe how nice it looks in the photo) and I just wasn't happy with it. I decided to just try gluing something onto the back of the cover to keep it structurally sound, but found that I couldn't get anything to stick to the chrome plating, even after heavily scratching the surface (going through to the brass in some places) and using Arardite Rapid Steel Epoxy (which is the closest thing to JB Weld I can find over here). So I figured this thing was getting so screwed up already that I would file a big chunk of the chrome plating completely off the back and try gluing again. Once I saw the bare brass, I thought I would try just one more time to solder it. This time, though, I spread quite a bit of flux over it too. I heated up a test area, and lo and behold, the solder took to it. So I flipped it over, filed off some of the chrome and soldered the top. It's a really obvious repair, but I don't care. I'm very happy with it. I may try to polish it up a bit more, but apart from that, I'm calling it done. I decided to tackle the rear tremolo cover first, since it appeared to be a much simpler job and also easier to replace should things go horribly wrong. I really couldn’t find any information about this on the Internet, so I did what seemed logical in my head, which was to sandwich the plastic in-between two panes of tempered glass, clamp the whole lot together, and heat it with a very hot hairdryer. After 10 or 15 minutes of heating the area above AND BELOW the cover, I took the top pane of glass off to confirm that the plastic had become soft, then clamped everything back in place and left it to cool naturally. Since I wasn’t in a hurry, I left it for 24 hours, although I’m sure that wasn’t necessary at all. 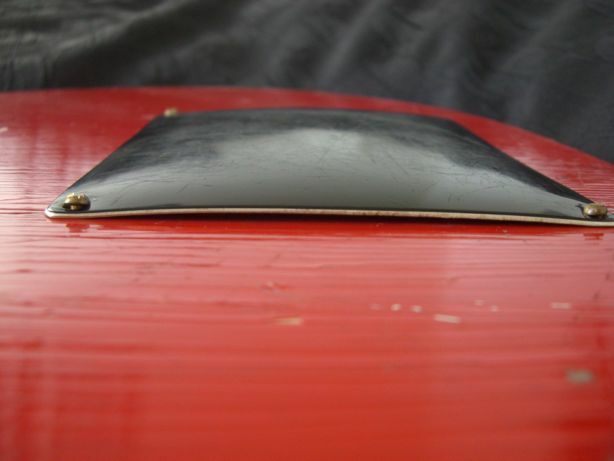 The tremolo cover came out completely flat. 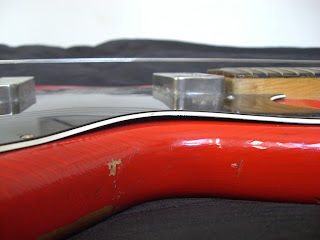 You can see a corner lifting slightly in this photo, but it’s really nothing and will easily be held flat once it is screwed to the back of the guitar body. Next up was the pickguard. 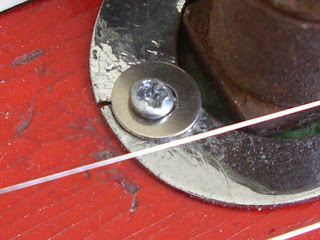 Not only was there some warping raising it up off the guitar body, there was also some bulging around the edges of the pickups, due to the pickups themselves bulging (as discussed here: http://diystrat.blogspot.com/2011/12/hofner-colorama-ii-restoration-project_12.html). 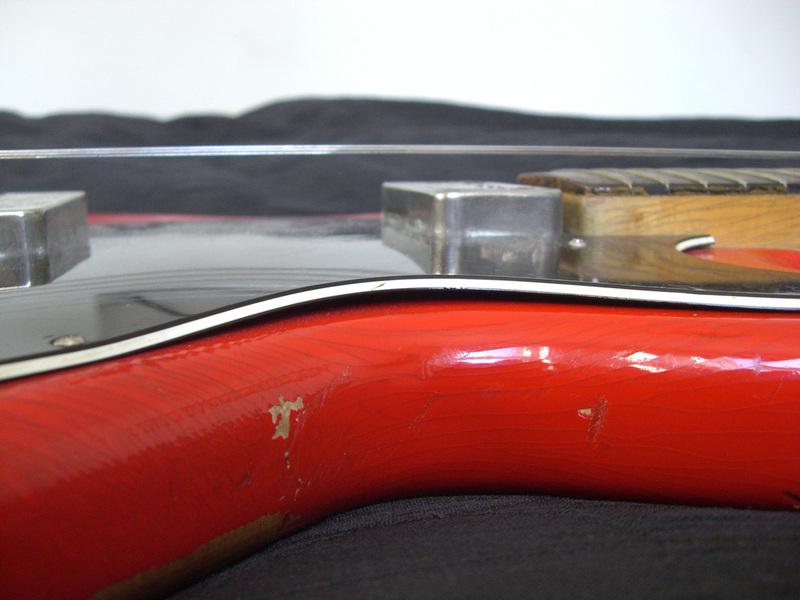 Even with the pickups removed, the plastic edges wouldn’t return to shape, so this would need to be dealt with too. 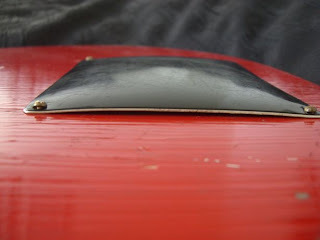 I tried the same trick as with the tremolo cover, but unfortunately the pickguard material is about twice as thick as the tremolo cover, and has a much larger surface area. Even after 20 minutes or so, I just couldn’t heat it up enough through the glass to make it soft. I didn’t want to apply the heat directly in case the surface of the plastic started to blister or something else equally damaging. It was recommended that I try pouring boiling water over the plastic, so I tried this method next. Before clamping it in-between the panes of glass and leaving it to cool down, I quickly used a flat-edged tool to push the edges around the pickup holes more or less back into shape. An internet search brought up a suggestion in a car restoration forum to rub peanut oil into the surface to restore the black sheen, but this method proved useless. Next option was to try black shoe polish, but surprisingly this didn’t make any difference at all either. So, I decided to get a bit more aggressive and removed some of the surface with some steel wool. Success! At least I knew now that the discoloration was only on the surface and could be skimmed off. Finally, rubbing compound was used to shine up the surface. And finally, here’s the end result. 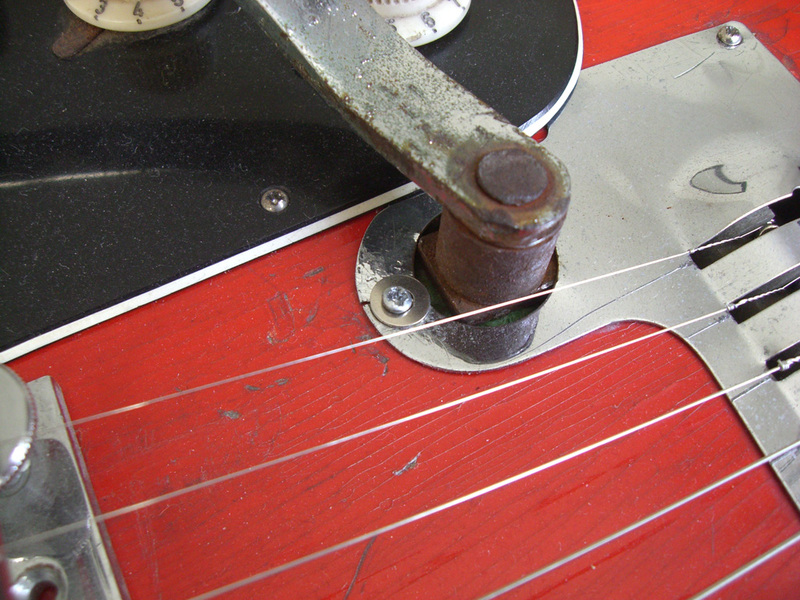 I'm also rounding the front end of the lever, since it was originally square in shape and was catching on and damaging the tremolo cover.